Mike Bailey did the round-trip (from the Visitor Center) in about 4h, September 16, 2007. Jorge Maravilla ran the round-trip in 2h51m26s on June 5, 2012. Fabian Eberhard ran RT from the VC in 2h49m4s on October 15, 2012. Mike Popejoy has the ascent and RT FKTs from the VC, 1h33m29s ascent and 2h35m05s RT, March 19, 2016. Randy Harve has the Sea-to-Summit FKT for Mauna Kea (from Hilo), 11h21m45s on October 27, 1990. Mauna Kea (13,796 feet) is the highest point in Hawaii, and the highest point in the Pacific. If you count the part of the mountain that is underwater, it is the tallest mountain in the world! Most hikers start from the Ellison Onizuka Visitor center at 9,000 feet elevation on the south side of the peak, which is accessible by a paved road. Above the Visitor Center, a 4WD road continues to the Mauna Kea Observatory, just below the summit. 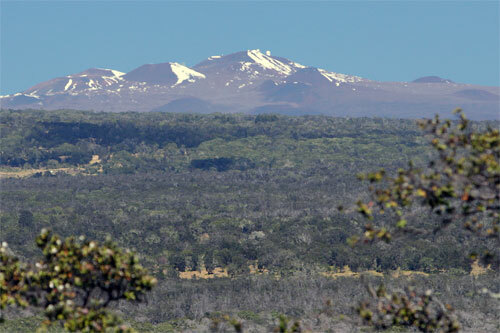 Hikers use the Mauna Kea Trail, which follows an abandoned dirt road, to ascend 4,800 feet over 6 miles to the top. Mike Bailey reports having run from the Visitor Center to the summit and back, via the auto road, in 4h "give or take a minute", on Sept. 16, 2007. According to Bailey, the road route is 9 miles each way. He started his run at 11:20 a.m., reached the summit at 1:55 p.m. (2h35m), and ran back down the road, arriving at the Visitor Center at 3:20 p.m. (1h25m). "Mauna Kea does not have record of a faster circuit time, although elite athletes should be able to go considerably faster. They just need to vacation in Hawaii more," he said. His blog post on the trip, written 2 years later, is here. Bailey explained some of the difficulties of ascending Mauna Kea on foot: "Unlike other mountains, like in Colorado, you are already at 6,000 ft when you begin your attempt. Thus, you have already spent time acclimating to the altitude. Most visitors, like myself, in Hawaii begin their day at sea level. My body experienced 0 ft to 13,796 ft in under 6 hours. This can cause numerous health problems, and thus the many stern warnings to visitors about hiking even a small part of the trail. Aside from the altitude issues, it is a very steep trail with a lot of climate change. The temperature during my run varied from 70 degrees at the start to 36 at the summit, with wind, fog, and rain." Bailey chose to use the auto road route, instead of the considerably shorter hiking trail, because "I guess I wanted to try the longer route. Ultrarunner mentality. If there's a shorter way, don't take it." "My wish is for runners to see my time, and set out to break it," Bailey added. "Plus I can't think of too many more beautiful places to run." As reported below, on June 5, 2012, Jorge Maravilla ran from the Visitor Center to the top in 1h44m, hung around on the summit of a while, then ran back down in 52m. According to Maravilla's data posted to www.strava.com/activities/10726658, the total round-trip time was 2h51m26s. We note here that round-trip times definitely include any time spent on the summit. Fabian Eberhard beat Maravilla's RT time on 15 October 2012 by spending less time on the summit. Eberhard ascended in 1h55m and descended in 54m, reporting (below) a total time of 2h49m04s. Mike Popejoy set new ascent and RT FKTs on March 19, 2016 (1h33m29s up, 2h35m05s RT), as reported below. 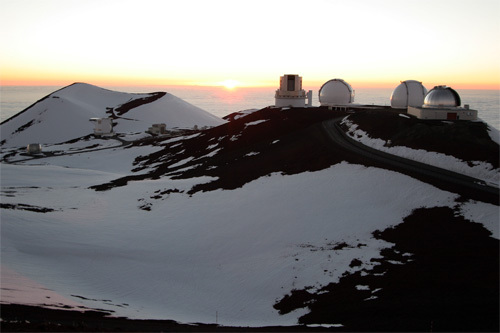 Mike Hotchkis reports (below) running "Sea to Summit" on Mauna Kea in 14h00m on 20 April 2015. Hotchkis started in Hilo. He gives info below on some past Sea-to-Summit runs. It appears the overall FKT for this was set by Randy Harve on 27 October 1990, 11h21m45s, also starting from Hilo. This was posted to the H.U.R.T. blog. There's a new official record for running up the Mauna Kea Volcano from the ranger station to the top and back down. Jorge Maravilla, the current RRCA 100 Mile Ultra National Champion ran a 1:44 uphill and a :52 downhill for a total time of 2:36 (not including a 10 minute break at the top to enjoy the view. . As near as we can tell, he broke the current "fastest known time" by a massive 89 minutes. He'll be posting his Garmin data on Strava shortly, but the vital stats are that his run measured 8.6 miles each way for a total of 17.2 miles, beginning at the ranger station, running to the absolute top of the mountain at the highest observatory. Those of us who watched him accomplish this astonishing feat, could barely breathe at the ranger station near 9,000 feet. Jorge, on the other hand, ran the entire mountain, climbing about 5,000 feet to near 14,000 feet while slowing only for a restroom break and a little fuel at the 5.5 mile mark. The run began at approximately 8:00 a.m. Temperatures were brisk at the ranger station and near freezing at the summit. Winds were approximately 20 mph. Oddly enough, Jorge's run coincided with Venus' transit across the sun and the observatory was packed with newly minted Jorge Maravilla fans (astronomers) who cheered him throughout the run and asked for pictures with him at the finish. One other interesting fact: The Strava record for climbing an 8.3 mile stretch from the ranger station to the top of Mauna Kea on a bicycle appears to have been 1:49, five minutes slower than Jorge ran the route. The round trip fkt definitely includes any time spent at the top. What was Jorge's total time? Sorry, I thought I included that he spent 10 minutes at the top. So his total time round trip is 2:36 plus 10 minutes -- 2:46. About 1:15 faster than the previous FKT. I am reporting Maravilla's round-trip time as 2h51m26s, as indicated by his data on Strava. FYI, the dirt path to the top is 8 miles long. I don't know how someone could run the whole thing. Some parts are incredibly steep and the dirt can be hard to get traction. I tried it last night, but then again, I started running from Hilo Bay, so that was probably part of the problem lol. It took me 5hrs to run from Croney's at Hilo Bay to the Access Road. I ran 2 miles of the access road until I hit the switchbacks. My friend drove me the rest of the way to the visitor center. From there, I ran to the 5 mile mark of the dirt road at the 12,000 ft elevation sign. 35 miles today in 7hrs 5 minutes. Longest run before this was a flat marathon. Everyone is talking about the record to run visitor center to summit and back, but what about sea level to summit? Has anyone done that? we ran Mauna Kea yesterday (Monday, 15.10.2012) starting at the Visitor Information Station. Like the other attempts stated in this forum we took the route starting at the visitor center running up and down Mauna Kea using the car dirt road. We herby report a new record by Fabian Eberhard in a time of 2:49:03. As soon as we are back home in Germany we will provide the GPS data to prove the new record. We attempted the new FKT in a team of two but only Fabian broke the record, pulling away at about mile 6.5 in the uphill. It took him about 1:55 hrs for the climb and 54 mins for the downhill. Our run was completely self-supported. The conditions were mostly sunny with some clouds and a little wind. The temperature at the visitor center when we left was about 65°. 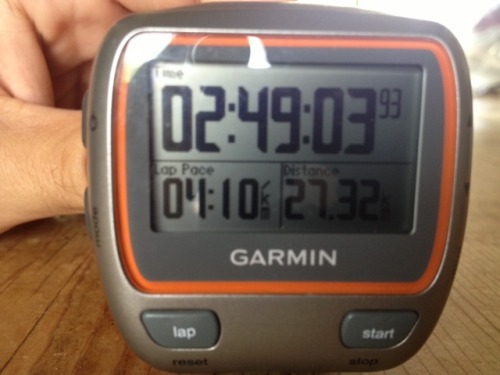 The attached picture shows the record as displayed on the Garmin. As said above, we will provide full details once we return to Germany in about 10 days. Here is a picture of the Garmin. We will provide a full read out ASAP. I haven't been on here since my original post in 2009, but I'm pleased to see the Mauna Kea route get some attention. Anyone who has ever been to the summit know that the white mountain is a very special place. I knew my "fkt" was pretty soft and figured it would certainly dip below the three hour mark. I've often wondered myself what I could do now having trained in Colorado at similar altitudes. My guess is maybe in the 3:15 range, but certainly not under 3 hours. Hopefully, I will find out when I visit in 2014 or 2015. Folks have also asked me how fast is possible on Mauna Kea, and I had speculated that sub 2:30 might be possible by an elite high altitude mountain runner. Sans stopping at the summit, and judging by recent times, maybe sub 2:20 is within reach. As far as running from sea level, I do believe there are running clubs who do timed runs from the town of Hilo, and other runs that start from the Saddle Road, which I believe is the 24 mile route Billy Barnett did in roughly 4 hours. Earlier this year I ran up from Hilo Bay to the summit of Mauna Kea. I was unsupported except for filling up with water at the visitor centre, where I also had a hot chocolate and a bowl of fruit salad. So I think my run counts as 'self-supported'. Mauna Kea Access Road: 10:30am, 6000ft. Ellison Onizuka Visitor center: 12:30pm, 9000ft (rested about 40min). Summit: just before 5:40pm, 13,796 feet. I walked this last section, up the trail; not the fastest 10km I've done! Stayed on to see a beautiful sunset. I claim 14:00hours total time, self-supported. This was done on the 20th April 2015 and I posted it to summitpost.org. Sorry, I don't have any other evidence, don't even own a GPS. My wife met me on the summit after I completed. I don't think she remembers when I got out of bed that morning! I live close to sea level in Sydney so have no altitude acclimatization. For that last section, I just had to take deep deep breaths and keep putting one foot in front of the other! This was clearly much harder and took longer. But in a comment at the end of the report Randy Havre says he and others have done it in the 1990s from Hilo and he claims a fastest time of 11:21. There is no detail so not known if supported or not. So my time may not be valid as a 'fastest'. In any case, I know several great trail runners here in Sydney who can easily do better times than me on mountain runs. My time (or Randy's) is waiting to be bettered. And, I'm sure it could be done unsupported. Well, get your plane tickets and do it!! Surely fkt sea-to-summit on the world's tallest mountain is worth going for! Finally reporting new FKTs for Mauna Kea, for the ascent and the roundtrip, unsupported, from back in March of 2016. Apologies for the extreme delay; I came on here to do some recon for an attempt on Wheeler Peak in NM and it occurred to me that I never posted about my Mauna Kea run. I started and finished at the visitor center, turning around at the highest point on the trail at the top. Roundtrip: 2:35:05 (includes about 13 seconds of stopping at the summit to take a quick look around); makes the descent 1:01:26. My focus was on the ascent rather than the round-trip. Howdy all--I am looking to go sea to summit. Looks like the established route is from Hilo side. Looked at HURT blog from link above; route not clearly defined. Anyone have more detailed beta on sea to summit route?